I think it looks like a naked squirrel. It could be any animal, just hairless. There are hairless dogs that people can buy. (Great for people with alergies)The best way to figure out what that is would be to compare it to other animals near where the photo was taken and see if it would look like another animal in that area with hair. It looks a lot like a tiny hairless hippopotomus to me. I've seen a naked mole rat. They're much thinner, and there skins are peachier. I think it look like a hippo too. It's a mini hippopotous! On second thought, it's head does look like a hippo. But it's standing like a squirrel. That's true Lisa but if so why is'nt it whith it's mother at such a young age? I agree it looks like a skin colored hippo. Looks like a miny hippo! Matbe some shaved hamster or something? When I looked at it it lookd like a squirrel but wheres the tail? Some one shaved that thing. 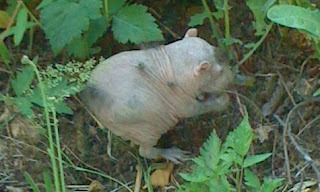 I think its a type of rodent that some one shaved.